Our orthopedics and sports medicine physicians are devoted to the diagnosis, management, rehabilitation and prevention of injuries and diseases of the musculoskeletal system. This system includes your bones, joints, ligaments, tendons, muscles and nerves that allow you to move, work and be active. Before seeking treatment, individuals with musculoskeletal problems may experience any number of symptoms including pain, discomfort, soreness, cramps, spasms, stiffness, loss of motion and weakness. Our sports medicine team helps to properly diagnosis and manage the issue through a comprehensive physical examination, personal consultation and diagnostic imaging. Depending on a patient’s plan for treatment, they work alongside our orthopedics surgeons, in addition to physical and occupational therapists and more, to provide a full continuum of care helping to safely heal and prevent further injury. For more information about orthopedic surgery, or if you would like to meet our surgeons in person, consider attending a free talk. 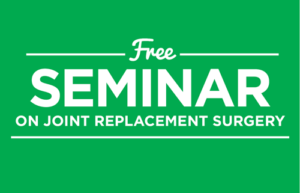 Throughout the year, our award-winning team hosts informative talks around the community to provide more information about our procedures and approach, as well as answer any questions you may have about joint replacement surgery. All events are open to the public but registration is required and space is limited. Please complete this Orthopedic Talks Form to attend, and select which talk/topic you would like to attend. We look forward to see you there!